Doofor designs and manufactures hydraulic rock drills in Nokia, Finland. By utilizing the strong Nordic traditions of mining and blasting machine manufacturing, we can produce the best and most advanced drills for demanding environments. Doofor Inc. is a company producing drifters and their original spare parts. Our philosophy is to offer the highest technical quality in the drilling industry. Unique Doofor drills are known as powerful, reliable and durable worldwide. High quality in our products is a result of expertise and know how of mining industry for several years. As a company we are innovative and development driven. We stand for the highest level of endurance and functionality for customers’ advantage. Our products are robust, easy to fit in various solutions and built to perform in hard conditions. We base our business to long-term customer partnerships. Doofor’s customers consist of companies offering high-quality drilling solutions, such as drill rigs and jumbos, excavator drill attachments, dimensional stone drilling rigs, TBM probe drilling systems, demolition and limited access drill rigs, geotechnical drill rigs and many more. Doofor’s customers consist of companies offering high-quality drilling solutions. We are global company and base our business in long-term OEM and dealer partnerships. We offer solutions through a wide range of hydraulic drifters. We also offer product customization according to customer’s needs. We also offer original spare parts and support for customers advantage. Doofor Inc. is a trustworthy, ethically working company with good reputation. During the years of operation, the company has achieved several classifications and certificates from highly regarded associations in Finland. 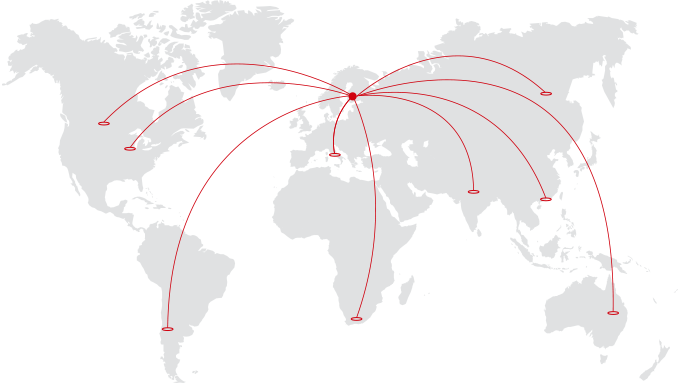 Doofor supplies to over 40 countries on five continents. Our current export rate is over 90%. We have wide global network and we cooperate with other high quality companies. Long term partnership with us guarantees stability and continuance to processes. WE OFFER THE LATEST IN HYDRAULIC DRIFTER TECHNOLOGY. DOOFOR CAN BE YOUR STRATEGIC PARTNER FOR YOUR SUCCESS.